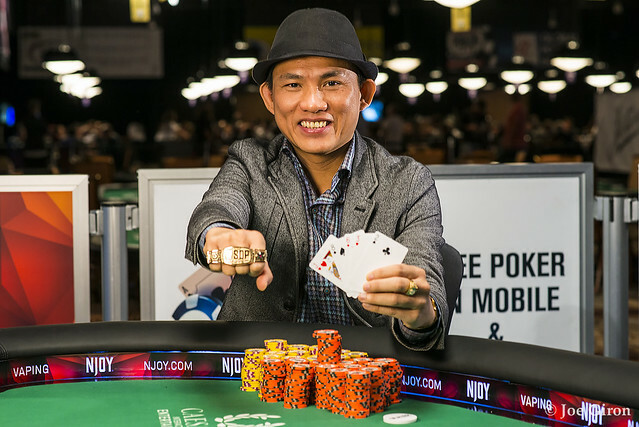 Personal Facts: Pham won a WSOP Circuit gold ring in the Main Event at Caesars Palace in 2013, which was his first series-related cash. Christian Pham Pham made the best mistake of his life. 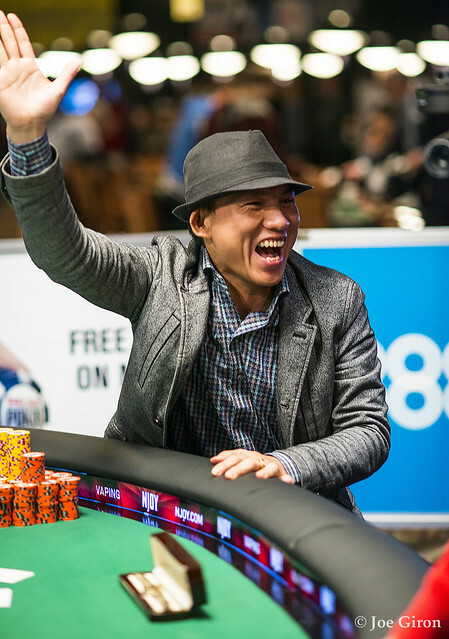 Three days earlier here at the 2015 World Series of Poker, Pham stepped up to the registration window at the Rio in Las Vegas and plucked down $1,500 in cash, thinking he was registering for the next day’s No-Limit Hold’em tournament. Unfortunately – or fortunately, as things turned out – he had the wrong event number in mind. 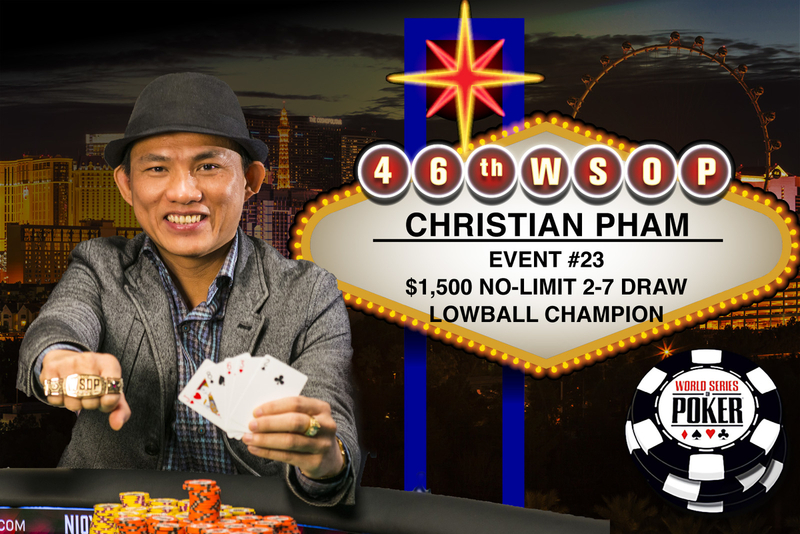 Pham was placed into the No-Limit Deuce-to-Seven Lowball Draw tournament, a game he’d never played before. Unaware of the error, Pham took his seat at the beginning of the tournament and then watched in horror as cards were dealt out in a different way than he was expecting. Pham had no idea what was going on, or what to do. Faced with no other alternative, Pham sat and watched. He folded most of his hands early on as he picked up more information about good starting hands and how to play. Pham proved to be a prodigal student. He paid attention to the finer details and nearly 12 hours after sitting down at a table and playing a poker game he’d never seen before, Pham ended the first day as chip leader. In fact, Pham’s two previous cashes took place in tourneys with huge fields. He finished in the top .1 percent (note the decimal) in the famed The Colossus event (53rd place out of 22,374 entrants) and then ended up in 215th place in the Millionaire Maker played just a week later. As the WSOP entered its third big weekend, Pham did more than just cash in this event, topping a considerably smaller but equally as determined field of 219 players on the road to a personal milestone and memorable victory. The 40-year-old former delivery driver-turned professional poker player dominated play much of the way, particularly during the final two days when he enjoyed a significant chip advantage during both sessions. Only 20 percent of the field returned for the second day of action, and Pham continued to swat away opponents like flies on a hot summer night, until action was suspended until the third and final day. Pham came into the three-handed finale in command of the lead, facing two tough opponents -- Daniel Ospina and Matthew Smith. 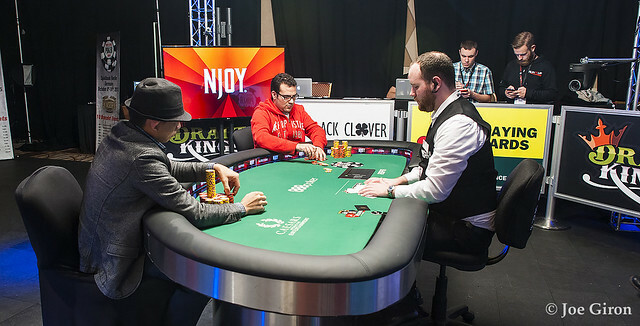 Shortly after play began, Smith was eliminated, leaving Pham and Ospina to battle for the gold bracelet. The heads-up match lasted nearly two hours, although Pham’s position never appeared to be in serious jeopardy. During most of the final stages, Pham enjoyed at least a 2 to 1 chips advantage. However, runner up Ospina put up a good fight. Ospina, who enjoys both Canadian and Columbian residency (and currently lives in Peru), hoped to become the first winner at this year’s series from South America, but came up just short. When asked if he plans to play in more Deuce-to-Seven Lowball events, Pham appeared to be a converted man. “We don’t have this game in Minnesota (where Pham lives),” he said. “I learned the game at the table. I was figuring out what to do as I went along, and I also got lots of good cards. That helped, too. “Now, I love this game,” Pham said. Second Place: Daniel Ospina, an international player from Canada, Columbia, and Peru, finished as the runner up. The 27-year-old poker pro padded his poker bankroll with a $50,260 consolation prize. 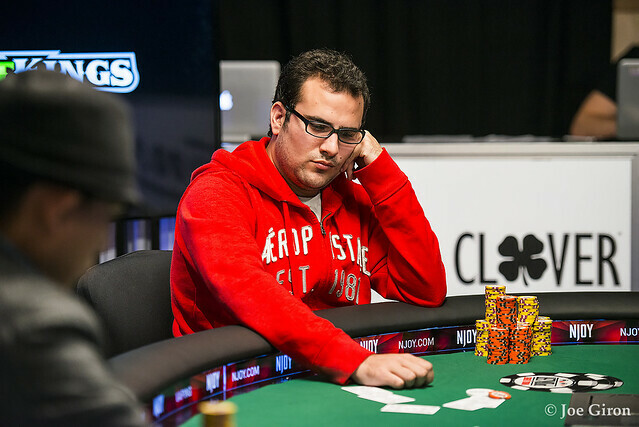 Ospina now has 10 WSOP cashes and more than $300,000 in winnings. Third Place: Matthew Smith, a 33-year-old poker pro and fantasy sports specialist from Tampa, FL finished 3rd. His 12th WSOP career cash was worth $33,163. Smith is known for winning the first “Millionaire Maker” competition held at DraftKings. Fourth Place: Andrey Zhigalov took fourth place in what was his second time to cash at the WSOP. The Russian poker player earned $22,634. Fifth Place: The 1996 world poker champion Huck Seed finished 5th, which paid $15,852. Seed was aiming for what would have been his fifth gold bracelet and first win since 2010, but he failed to challenge Pham for the lead at any point. Seed, from Las Vegas, now has 51 WSOP cashes and in excess of $3.1 million in earnings at the series. Sixth Place: Alexsandr Denisov was one of two Russians at the final table. The Muscovite took 6th place, paying $11,385. Seventh Place: Mike Leah, from Toronto (Canada) finished 7th. This was his 39th career cash, and the $8,381 he collected places him just shy of $1 million in career winnings. Leah won a gold bracelet at last year’s WSOP Asia-Pacific event, in the High Roller Championship. 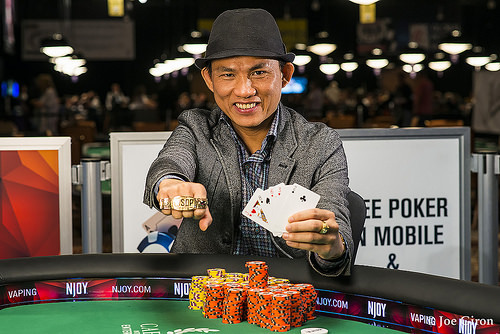 He also owns two WSOP Circuit gold rings. Eighth Place: David Matthews rounded out the final table with an 8th-place finish. The pharmacist from Winchester, VA pocketed $6,320. Other players who cashed in this event aside from those who made the final table included – Robert Mizrachi (9th) and Frank Kassela (14th). 2014 WSOP November Nine finalist Jorryt can Hoof finished 10th. The field included 216 males and 3 females. The average age of participants was 39 years, slightly higher than the WSOP tournament average. Daniel Ospina Eliminated in 2nd Place ($50,260); Christian Pham Wins! Christian Pham moves all in from the button. Daniel Ospina is in the big blind and he calls for his last roughly 110,000. At the draw, Ospina takes two new cards and Pham pulls one. The new cards are dealt and their hands are opened. Pham is first to look at his new card. He slowly squeezes it out. "Yes," says Pham. "Made it." He rolls over a , completing his jack-eight low. Ospina looks at his first card and quickly squeezes out paint. He rolls over a , ensuring that he is drawing dead to the last card. Ospina completes his hand by tabling an and he becomes the runner up for $50,260. Pham wins his first WSOP bracelet as well as $81,314 in first-place prize money. Daniel Ospina raises to 40,000 on the button and Christian Pham calls out of the big blind. Pham draws one and Ospina stands pat. After the draw, Pham leads out for 100,000 and Ospina raises to 320,000 and Pham goes into the tank for almost three minutes before moving all in. Ospina quickly folds and is left with roughly 10 big blinds. Christian Pham raises to 40,000 on the button and Daniel Ospina three-bets to 110,000 out of the big blind. Pham calls and Ospina stands pat. Pham takes two cards and then Ospina bets 30,000. "Damn," said Pham as he looks at his cards. Pham tosses his hand into the muck and Ospina scoops the pot. Daniel Ospina raises to 40,000 on the button and Christian Pham calls. Pham takes one card and Ospina stands pat. After the draw, Pham leads out for 110,000 and Ospina folds. Christian Pham raises on the button and Daniel Ospina calls out of the big blind. Ospina takes two and Pham draws one. After the draw, Ospina check-calls 45,000 from Pham. Pham shows , giving him a pair of threes and Ospina scoops the pot with . Daniel Ospina raises to 30,000 on the button and Christian Pham calls out of the big blind. Pham draws one and Ospina takes two. After the draw, Pham leads out for 75,000 and Ospina calls. Pham shows , good for a pair of deuces, but Ospina shows a pair of threes and Pham takes the pot with a pair. "Deuces never looses," yells his rail as Pham stacks the chips. Daniel Ospina raises to 30,000 on the button and Christian Pham three-bets to 100,000 out of the big blind. Ospina makes it 200,000 on the button and Pham calls. Both players stand pat and Pham quickly checks. Ospina hesitates for just a moment before moving all in for his last 276,000, which sends Pham into the tank for almost three minutes. "It's close," said Pham. "Very close." After three minutes in the tank, Pham tosses his hand into the muck and Ospina puts a dent into the chip deficit he's facing. 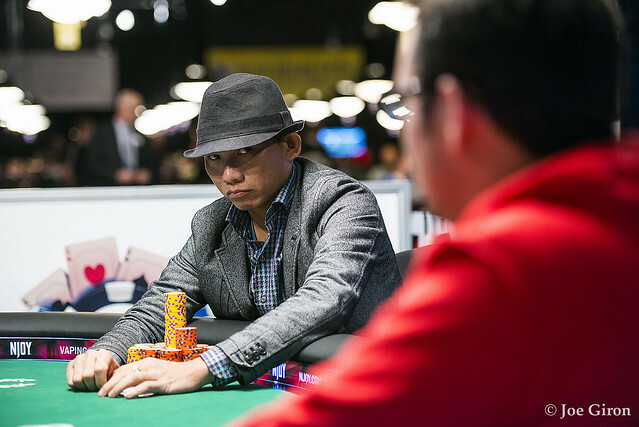 Christian Pham raises to 30,000 on the button and Daniel Ospina calls out of the big blind. Both players take one card and Ospina check-calls 35,000 from Pham after the draw. Pham tables and just notches Ospina's . Daniel Ospina raises to 30,000 on the button and Christian Pham calls out of the big blind. Both players draw one and both players check after the draw. Pham shows and Ospina mucks his hand. Daniel Ospina raises to 30,000 on the button and Christian Pham calls out of the big blind. Pham draws two and Ospina takes one. After the draw, Pham checks and Ospina bets 25,000. Pham check-raises to 100,000 and Ospina takes a moment and folds. Daniel Ospina raises to 30,000 on the button and Christian Pham calls from the big blind. Pham draws two and Ospina stands pat. Both players check after the draw and Pham shows , giving him a pair of nines and Ospina takes the pot with . Daniel Ospina raises to 30,000 and Christian Pham three-bets to 100,000. Ospina folds and Pham drags the pot. Daniel Ospina raises to 25,000 and Christian Pham three-bets to 75,000 out of the big blind. Ospina calls and both players draw one card. Pham leads out for 150,000 and Ospina takes some time in the tank before calling. Pham shows and Ospina mucks his hand. Daniel Ospina raises to 25,000 on the button and Christian Pham calls out of the big blind. Both players take two cards and after the draw, Pham leads out for 27,000. Ospina raises to 130,000 and Pham calls. Ospina shows and Pham mucks his hand. Daniel Ospina raises to 25,000 on the button and Christian Pham calls out of the big blind. Pham takes two and Ospina stands pat. After the draw, Pham checks and Ospina bets 55,000. Pham check-calls and Ospina shows . Pham mucks his hand and Ospina scoops the pot. After the draw, Daniel Ospina checks and Pham bets 45,000. Ospina check-raises to 195,000 and Pham calls. Ospina shows , but is pipped by Pham's . Pham takes the pot and opens up nearly a 3-to-1 chip lead over Ospina.